The incredible disappearing meatlessballs & Shower me with awards why don’t you! I’ve recently been the happy recipient of a blog award! Lucky me! Jessica of Awesome. Vegan. Rad. 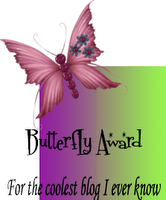 and River of Wing It Vegan fame have both honored me with The Butterfly Award. I think both of these rather groovy chicas are the bee’s knees and always look forward to the amazing goodness on their blogs (like River’s donuts & Jessica’s brinner. Excuse me while I feel sorry for myself because I don’t have some of that deliciousness happening on my dinner table right now). Thank you both, because you make me feel all special and loved, and darn it, that’s cool! Can I just say that I find this award hilarious because of its grammatical ineptitude? I’m serious. I love that it’s a bit whimsical yet silly, rather sweet yet imperfect. Reminds me a little bit of myself! I’m supposed to pass this on, but I’m not terribly good at such things, so here’s the deal – if you’re on my blogroll (see link love above) you are thusly nominated. I believe I’m to pass this on to 10 people, which means that I am nominating far too many people, but I have issues with a) maths, and b) rules. The thing is, if you’re on the roll, I totally dig you, so it’s sincere – and that being said, I lost many links during the re-design so please don’t hesitate to drop me an email or message if you notice yours is missing! Now for those meatlessballs! A few weeks ago now the superadorablesweet Jessy of Happyveganface posted Dan’s Greenrice & Tempeh Meatlessballs. ( I’ll try to not make any sophomoric jokes, but it’s not easy.) As with many of Jessy’s recipes, it sounded like it should be made post-haste, and my friends, it was. These tempeh boulettes (meatballs) are really amazing – I was out of tahini when I made them so I subbed aprox. 2 tablespoons gluten flour to give them some grip, and it worked beautifully. These were so good that we were rather disappointed to not have another package of tempeh in the fridge to make some more the following day! But no picture? What’s up with that? Well, I’ll tell you…Monsieur Fish rarely uses the camera, but he did, and luckily I had only a few pictures on it because he accidentally erased them all. I wasn’t going to blog about a meal sans photo, but this meal is really worth mentioning! You’ll get some eye candy when you go to Jessy’s blog for the recipe! Congrats on your award – I think you totally covered everyone there – nicely done. I thought the grammatical ineptitude was funny too! Oh and Jessy and Dan’s meatless balls do look awesome! Hope your footsie is feeling better! i am a tempeh addict!!!! i just can’t get enough of the stuff. those meatballs sound too good to be true. Congratulations! Your blog is wonderful. I look forward to it every day. the grammatical error on that award made me sweat a little, myself. things like that make me just a tad insane haha… and i’ve been meaning to try those meatlessballs from jessy’s blog. good to hear how awesome they are! Meatless balls leave one with so many comebacks that it’s impossible to choose just one. 🙂 They sound rad though! Congrats on the award! And don’t worry about the pictures, I can imagine how good the meatless balls were! le fait que les maths et toi, ca fait 30 ne fait qu’augmenter mon admiration pour toi. You’re definitely deserving of a word, grammar be damned! 😉 Thank goodness you only lost a few photos; that could’ve been disastrous! Congrats on your award–but of COURSE you have a cool blog! I love the sound of those meatless balls (mrrph giggle giggle)! I rarely eat fake meats, but love to make my own variations with tofu or tempeh, so these will be great. congrats on the award, Shelly! superhappyface! i too love the grammatical ineptitude! made me smile! thanks again for trying out our recipe – we’re sooooo glad you enjoyed it! makes me go “squeeeeeeeeeeeeeeeeeeeee!” ahahhhaaaa! and boulettes sounds sooo much better than “meatballs”. i love it! hope you had a rock’n weekend – and i am sending you lots of happy thoughts and hugs! congrats on your award. And you are so right about Jessy’s recipes! Congratulations on the award! I’m terrible with those rules too. I’ve been craving bbq tempeh but the meatlessballs sound really good. Don’t even get me started about the times I’ve tried to let John take pictures. I get shots of everyone’s scalp.